Violet King knew she wanted to be a farmer when she saw that her grandmother’s community in Fort Worth, Texas, was more of a food desert than the Anacostia neighborhood in Washington, D.C., where she lived. Now, as an urban farmer in the District and farm manager of Dreaming Out Loud, she’s able to educate her community about healthier food options through sustainable farming and provide food options through community supported agriculture. "I got involved in the food system because I know what it's like to be a mother and have children and have limited access to healthy food," Ms. King said. "It feels good to be able to provide healthy food to people that live in my community." National leaders in all aspects of the food industry gathered to discuss potential solutions to problems younger members of the food system are facing, such as responding to demand from younger consumers for responsibly produced food, investing in young farmers and consumers by building the necessary social infrastructure and using technological innovations to draw more young people to careers in the food system. One of those discussions focused on what is being done legislatively to help the country’s farmers, which included Reps. Chellie Pingree (D-Maine) and Dan Newhouse (R-Wash.). Mr. Newhouse emphasized that the government needs to have policies in place that ensure there are domestic and international markets available for farmers. Ms. Pingree said that she’s seen a difference in the way her colleagues understand their constituents’ interest in sustainable agriculture and knowing what’s in their food. "Policymakers who usually lag quite a bit are really catching on,” Ms. Pingree said. “I think there's a real interest and awareness and a lot of it has to do with many farmers coming to the Hill all the time." 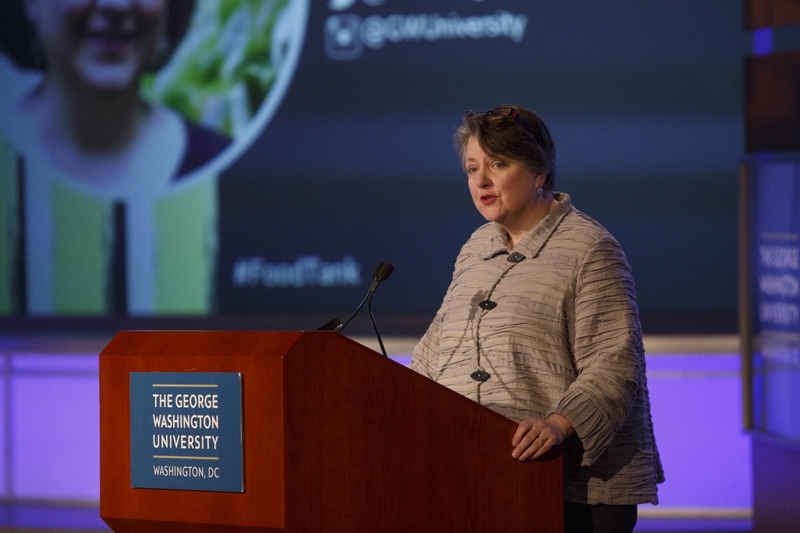 Kathleen Merrigan, executive director of sustainability at GW, deliverd the opening remarks at the 2018 Food Tank Summit. Kathleen Merrigan, the executive director of sustainability at GW, discussed during her opening remarks some of the challenges young farmers are facing such as debt carried from undergraduate degrees, lack of access to land and the affordability of farming as a career. "There seems to be widespread agreement that American agriculture is in crisis because we haven't figured out how to transition our working lands to that next generation of farmers and ranchers," Dr. Merrigan said. Dr. Merrigan also moderated the “Growing Farmers around the Globe” panel, which included farmers and farming advocates who discussed some of the challenges they have seen and faced such as having a sustainable living wage, technical support, equitable access to resources and education for people of color and breaking barriers within the food system. MJ Altman, the editorial director of the nonprofit organization World Food Program, said during the panel that she has seen farmers globally struggle to become successful. She added that innovative ideas from the younger generation can provide solutions to infrastructural barriers farmers are facing, like the need for roads to transport crops or airtight silos to effectively preserve a harvest. "We hear a lot that young people aren't interested in farming, but I wonder if it's just they're more interested in doing it differently than the way their parents did,” Ms. Altman said. “Because food production draws on so many different sectors, what that means is young people today can be involved in agriculture in so many different ways." Haile Thomas, 17-year-old CEO of the Happy Organization, a nonprofit that she co-founded with her mother when she was 12, was the keynote speaker for the summit. As an international youth advocate for healthy lifestyle choices, she spoke about the importance of intergenerational collaboration in getting the next generation involved in the food system with an emphasis on better inclusivity and education.